The worship of the Goddess is sacred and powerful and it gives results quickly. Few have the proper understanding and Blessings to access the Feminine Energy appropriately. Navratri is a time to celebrate the Goddess, to celebrate ALL things beautiful, ALL things luxurious, and ALL things that give happiness. The Goddess rules the Moon and guides your mind in the right direction. The feminine energy activates specific areas of your brain. It uplifts or purifies the planets and their effects. She Awakens Your Creative Potential, helps Manifest Loving Relationships, and Brings You Abundant Wealth. There are ways to connect with the Goddess so that she is always with you. Invoking the Goddess is a Super Technology and only a few adepts know the true secrets of Goddess worship. In order to remove poverty and ignorance from the earth plane we need the Goddess. And during the 9 Nights of Power, it is possible to invoke the 3 Goddess Archetypes of Protection (Warrior), Abundance & Wisdom. 9 Nights of the Goddess (Navratri) is your chance to connect with the 3 Goddesses. Each year during the 9 Nights of Navratri, the 3 Goddesses descend to awaken the Earth from a deep slumber. This is a Fight for Light that is led by Goddesses Durga, Lakshmi, & Saraswati who embodies All Divine Feminine Power. They descend upon the earth in their warrior form, destroying evil and bringing Love, Joy & Light. This year, the 9 Nights occur on October 16th – 23rd. The Golden Age will be ushered in by the Goddess, but the Golden Age is not assured. We have our role to play to ensure that the Divine Feminine is fully awake and activated on the earth plane. The ancient rishis & yogis created the sacred tools to bring the Goddess to the Earth. Without the Goddess, there is no life. Durga is the Overlord of Rahu. Her energy counteracts and destroys Rahu negative influence. Lakshmi is the Overlord of Venus. She brings pleasures, comforts and fun into your life. Saraswati embodies intelligence, that which is essential for academic mastery, music and dance. The 3 Goddesses will cut through the darkness and bring prosperity, knowledge, and the power you need to get through obstacles, hurdles or struggles in life. 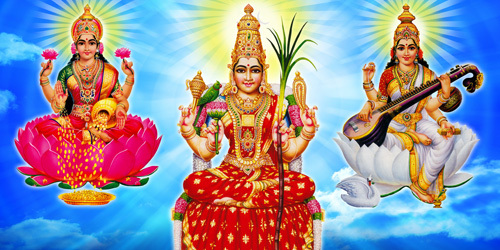 We have created the following products, so that you may develop and strengthen your personal connection to the Goddess. These are one of a kind product that is specially designed to hold the 2012 Navratri Celebrations and Empowerments. 1) A beautiful multi cut Crystal Necklace with a pure silver Shreem Brzee Lakshmi Pendant. 2) Only a limited number available (20), For the first time ever we have a Shreem Brzee Goddess Lakshmi Statue in her happiest form, Sitting upon a Lotus Flower. To bring forth her wealth giving properties, a special blend of empowered proprietary ingredients is applied, including the sand from 8 of her most powerful Lakshmi vortexes. 3) The concentrated form of the Goddess resides in the Maha Meru, holding a million Goddesses’ energy. Maha Meru is the three-dimensional, sacred geometry of Sri Chakra. Activate and bring full Goddess Power into your being with daily Light offerings to the Maha Meru. The Maha Meru will be energized in all the rituals at the AstroVed Fire Lab during Navratri.